At the time when the entire country was gearing up for a long drawn struggle to unshackle the bondages of slavery and high handedness of British rulers, seeds of a silent yet far - reaching revolution were being sown by a handful of visionaries in a distant sleepy village called Kandivli located about 23 milesfrom Bombay city. It was in the year 1936 that Sri. Jamanadas Adukia, Sri. Gokaldas Ranchoddas and Sri. 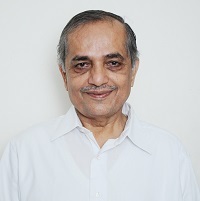 Lavji Meghji, along with few other like-minded and large hearted local businessmen decided to take a small step forward and founded The Kandivli Education Society (KES) with a noble and patriotic objective of providing education in vernacular medium to the children from Gujarati families settled in this part the Bombay province. The Society was registered under the Societies Registration Act, of 1860 vide registration no. 1557 of 1947-48 in June, 1947 and the Bombay Public Trusts Act, 1950 vide registration no. F – 253 (Bom.) in 1953. As a result of the efforts taken by the initial members of the Society, Shree Kandivali Vidyalaya was started on 31st March, 1936 with an initial enrolment of 13 students. In 1960, the school was renamed as ‘Sardar Vallabhbhai Patel High School’; which popularly came to be known as SVP School over the years. Realizing the need for technical education, a technical section was started in 1961 and a Junior college section in science stream was added in 1976. The Junior college section was renamed as Shri. T. P. Bhatia Junior College of Science in 2004. Currently the SVP School has more than 4500 students on its roll while the T. P. Bhatia Junior College of Science has an enrolment of about 2500 students. The establishment of SVP Night School in 1970 reaffirmed the commitment of KES to rise to the expectations of common man. It provided opportunity for many deserving youngsters to acquire knowledge and upgrade themselves while continuing to earn their livelihood. The year 1984 saw the establishment of Sangeet Mahavidyalaya affiliated to the Akhil Bharatiya Gandharva Mahavidyalaya Mandal, Miraj. It provided an ideal platform for hundreds of students who were passionate about pursuing their interest in Indian Classical Music, both vocal and instrumental, and dance. A step forward was taken in 1989 when KES College of Arts & Commerce was established as it opened avenues of degree level education for local population. Later, in 2008 the college was renamed B. K. Shroff College of Arts and M. H. Shroff College of Commerce. Today the college is permanently affiliated to the University of Mumbai and has a registered enrolment of 4100 students. In 2009, KES ventured into the arena of international education when it started the KES Cambridge International Junior College offering ‘A-level’ program of the University of Cambridge, United Kingdom. This certification is recognized as entry-point qualification to undergraduate program in over 125 countries across the world. Today as many as 13000 students are studying at KES institutes. The journey from 13 to 13000 has been quite remarkable. The magnificent contributions by many luminaries and philanthropists in terms of their time, money and efforts over the years have made the KES an outstanding and exceptional educational organization that it is today.